Photo courtesy of Breedlove Land Planning, Inc. 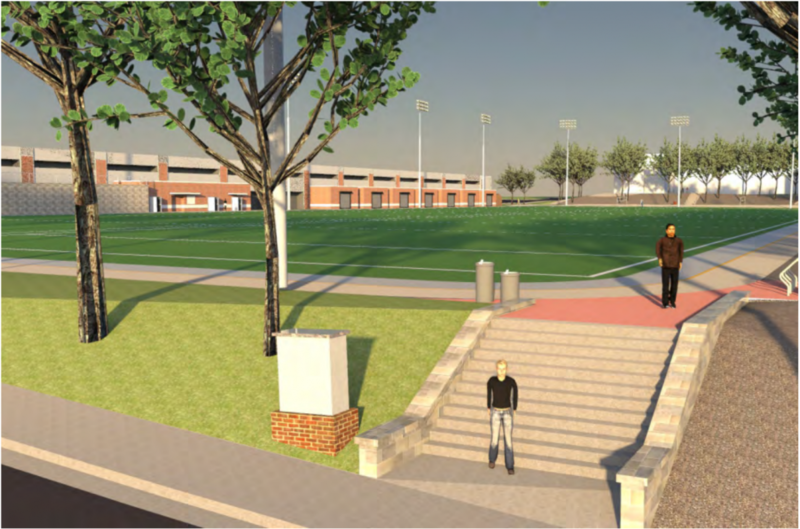 Above is a photo of the design showcasing the anticipated renovations for the SAC fields. The $4.5 million construction project was recently passed by SGA. Weeks after the Campus Recreation Center (CRC) requested funding from the Student Government Association (SGA) for the renovation to the SAC Fields, SGA finally passed funding bills for the project in the Undergraduate House of Representatives (UHR) and the Graduate Senate. The original request by the CRC requested $1 million from SGA, $600,000 to pay for roughly half of the field renovation and $400,000 for new sports storage units along the parking deck. The Graduate Senate passed the bill introduced by the executive branch, but cut the funding to $600,000. The senators felt that funding the full $700,000 would not leave enough money in the capital outlay account for next year. UHR considered reducing funding as well, but settled on the original $700,000, reasoning that the full amount would still leave plenty of money for next year and that the fields were important to a large majority of students. A conference committee will be held to resolve the funding differences between the House and Senate and an email vote will be held for both houses to pass the final bill. The delay between the original talks with the CRC and SGA in February and the funding of the bill was the result of internal funding issues in the Division of Student Affairs. During the initial talks with the CRC, it was revealed that Student Affairs had approximately $450,000 in unallocated funds. Current SGA leadership had no knowledge of this funds existence prior to this point. Student Affairs had also been keeping the accounts from the student activity fee, CRC fee, the athletic fee and various other fees in one account which was distributed to organizations receiving fee money. Over the years, close to $250,000 was accumulated in unallocated money and until recently was unknown to members of SGA. “[These are] horrible accounting practices, but that’s the way it’s been done for 20 something years,” Farmer said. After discussions with Student Affairs, the approximately $450,000 was distributed between the two main SGA accounts – prior year and capital outlay – and a new account named the Student Activity Fee Reserve Account. Student Affairs also separated the student activities fee revenue into a separate account which is solely allocated to SGA, the entity responsible this funds’ allocation. The unexpected increase in funds and the resolution of the funding issues enabled SGA to allocate the requested money to help pay for the SAC fields renovation. The rest of the funding comes from the CRC reserve account and the Institute Discretionary Endowment. The planned renovations perform the necessary replacement of the nine-year-old field and add new features for students. The project would replace the synthetic turf with a safer and more natural one, add a 1/3 mile walking ath, add new light fixtures and add storage units along units for use by students groups.